24/55 Reagen Sulewski It's misleading to call this an anti-Bush film, though you can see where that comes from. Typical Sayles, in that it's got great ensemble work, and a muddled, over-ambitious plot. If you're Newmarket Films president Bob Berney and you've just overcome all measure of controversy to propel a potentially divisive film about the last hours of Jesus Christ to wildly unexpected heights, what do you do for an encore? That's right, you pick up a film that heavily satirizes President George W. Bush and the current state of American democracy, and make plans to release it right in the middle of his presidential campaign. A political drama/murder mystery set in the "New West" of a small town in Colorado, the story will be set against the backdrop of a gubernatorial race that offers lampooning opportunities galore. 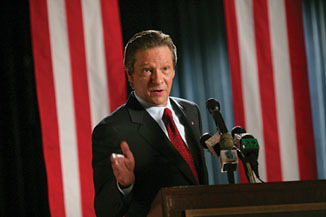 Chris Cooper, recent Best Supporting Actor Oscar winner for his performance in Adaptation., will play a character that Variety describes as a "thinly veiled caricature of George W. Bush." His character, the Colorado gubernatorial candidate, is grammatically challenged (we wonder if he'll say 'strategery') and a born-again Christian. As his campaign progresses to its critical juncture, a man's body is discovered in a local lake and the mystery surrounding his murder threatens the race for election, the special interest groups pulling the candidate's strings, and even the candidate's entire family empire.